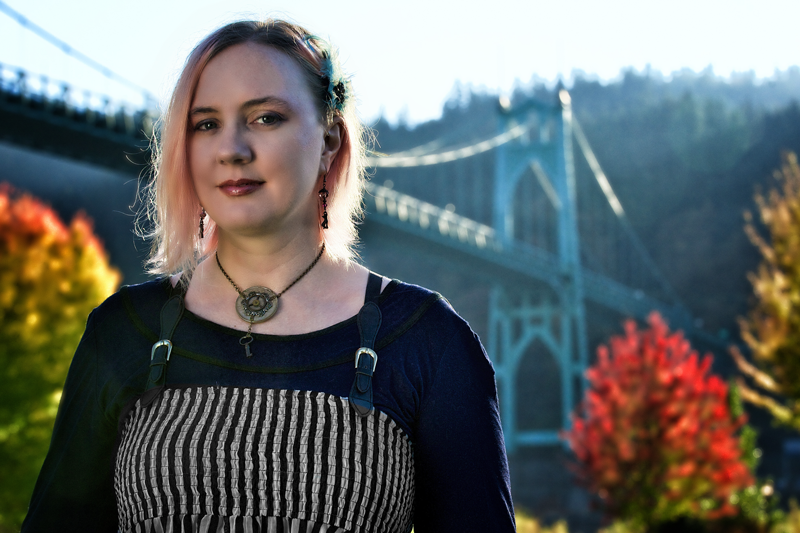 When graphic designer Theresa Pridemore set out to create a Portland tarot deck, she envisioned a modern arcana with a new treatment of the archetypes found in classical decks while adhering to the spirit of traditional tarot. She has built 23 works of graphic art featuring Portland residents set in collages of local scenes and artifacts. 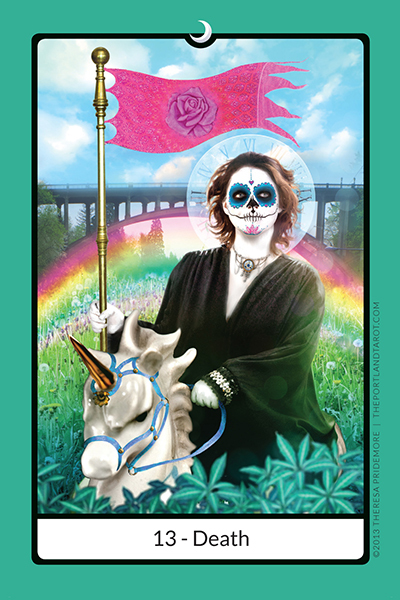 The Portland Tarot features iconic imagery throughout Portland with a focus on the many bridges that connect the city. The deck was designed in Pridemore’s studio in St. Johns, which sits on the second floor of Cathedral Park Place (originally the home of Portland Woolen Mills) and has a wonderful northern view of the the Willamette. The room has all the trappings of an adult playhouse. There are remnants of costumes, layers of fabrics draped over partitions, antique furniture, tea sets, an old typewriter, feathers—and along one wall, a command center of very serious graphic-design hardware. This is where the magic happens, where Pridemore transforms her models into archetypes: Portlanders who have been selected to appear in the cards with which they resonate. A practitioner of tarot, Pridemore transcends the stereotypical mystic. She is not Eliot’s Madame Sosostris, described in the Waste Land as having a “wicked pack of cards.” She and her deck are a friendlier, less ominous encounter, welcoming even to the skeptic as a means by which to understand one’s self through the analysis offered by a conversation, spurred by the simple spreading of cards. Pridemore has been studying tarot and divination since 2008 and refers to the practice as “intuitive arts.” Unlike Sosostris, Pridemore makes no claims of clairvoyance, but she embraces the notion of perceptions and spiritualism beyond the scientifically recognized five senses. 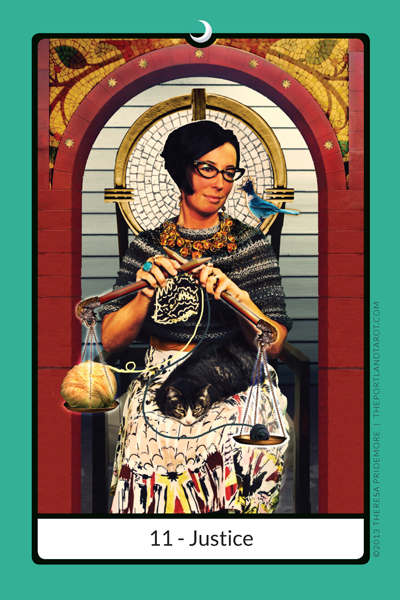 In her deck, Pridemore revisits 22 archetypes of the traditional tarot, and through her graphic arts and photography modernizes and grounds the practice through a fresh look at the meanings behind each card, and by using a uniquely Portland approach. Marrying this idea with the importance of reflecting our regional culture is not a stretch. The rethinking of classical archetypes is a natural fit for Pridemore. In the background of this card is the Vista Bridge, a favorite choice of jumpers. Death is normally depicted atop a white horse. On this card, she rides a unicorn—a very stern unicorn. Her face is painted in the style of a Dia de los Muertos candy skull (an idea from the card’s model, Brooke Redbird). Death’s gaze is not directly at the viewer but is upward slightly as if guiding the viewer toward the future. Marie Ballance has the perfect name (save that one extra “L”) to model and hold the scales in Pridemore’s Justice card. Pridemore depicts Justice not as a judgmental figure but as a seeker of balance and a nurturer. The motherly and even saintly figure calmly knits, her scales holding her skeins of yarn. Not only are bridges featured prominently in Pridemore’s design of the cards, but the use of her cards also relies on Portland bridges as a prominent theme. The instructions for the three, three-card bridge spreads included with her deck feature the Vista, Fremont, and St. Johns bridges. The Vista Bridge spread is used for guidance and encouragement during times of difficulty or loss. The St. Johns spread is used for inspiring insight into romance, self-initiated transformation, and boosting creativity. The Fremont spread can be used for practical advice on daily matters. In the print version of this issue available November 10, 2013, you’ll find Pridemore’s Major Arcana tarot deck in miniature, which the artist has kindly allowed us to offer our readers for their own tarot experience. We’ve included some handy lines to guide your cutting. We would enjoy hearing back from you on your experiences with this functional artwork, so please leave your feedback in the comments section below. More information on The Portland Tarot, including photos of all the Major Arcana cards, can be found at www.theportlandtarot.com. This is an amazing deck! The depth of each card, all the symbols brilliantly (and beautifully) marry the old to the new. I was an early adopter of the deck and its easily the most beautiful/creative and fun deck I’ve ever used. And, loving all the Portland weirdness – way to represent!